Some people have found that the glass back on the new iPhone 4 can break when dropped. This has led to the false idea that using glass was a stupid idea on Apple's part. This ignores two simple facts: The first is that the display has been glass for years without any big complaints, and the second is that the right glass can be incredibly strong. Glass, like any ceramic, is very strong in compression. This means that it can handle weight pushing on it. Glass is weak in tension and shearing (being pulled or bent). What usually breaks glass is bending or being struck by a pointed object. Bending causes the inside to go into compression, which is just fine, but the outside is in tension, which is bad. Glass almost explodes into pieces when it is bent. Pointed objects hitting glass also cause it to break, because all the force is concentrated into a small area. Glass is tempered or toughed by cooling it in a way to create stress on the surface. Stress is usually bad: No one likes stress at work, and stress on an object can break it. But with glass, the stress is compressing the glass. Remember that glass is stronger in compression. With tempered glass, when someone bends it, the force has to overcome the built-in stress before it will break. I got my degree in Material Science, so I've spent a few years learning how to make materials stronger and how they break. Using glass is fine for all sorts of things - you just need to know the limitations. The right kind of glass at the right thickness can stop a bullet. Windows on submarines withstand thousands of tons of pressure safely. Sure, glass can and does break, but only when you use it incorrectly. One of the guys at Gizmodo dropped his iPhone on the first day. One small drop (three to four feet) onto the curb, and the back was broken. Did he have a case to protect it? Did he use one of those bumper things that Apple sells? If you look at the picture on Gizmodo, the crack seems to start from one spot on the edge. There is a reason for this. Tempered glass, which I assume Apple is using some variation of,* is extremely sensitive to damage at the edge. One place I worked used tempered glass on work tablets for cutting materials and building parts. The glass could take a lot of abuse without wearing out, perfect for the kind of work we did. But if you accidentally tapped the edge with a box knife, the whole thing would shatter into a million pieces. This happened a couple of times until we protected the edges. There is a special type of glass that really shows both how strong and weak glass can be, Prince Rupert's Drops. These are made by dropping molten glass into water. They make a teardrop shape. The bottom is strong enough to take a hammer blow, but if you bend the tip it will explode into small bits. Apple's choice of glass is not stupid, but iPhone 4 owner need to do a couple of smart things - either never drop the phone on its edge or protect the edges. At our house, the first thing we do with a new iPhone is buy a case for it. iPhones are not cheap to replace, so buying a nice case only makes sense - but if you want to trust yourself to never drop your iPhone, be my guest. Apple expects most people to buy a case. If you are too cheap to buy a case. At the very least, put a rubber band or some thick tape around the edges. Apple sells bumpers and cases for a reason. If everything I say is true, why didn't Apple either build shock protection around the glass or give bumpers away with the iPhone? Since Steve Jobs doesn't call me to explain things, I'll have to make a guess. First is the fact that the look of an iPhone is strikingly different with bumpers. Sometimes Apple picks design and then tries to get function to work around it. Second, Apple knows that most people (probably 90% or better) buy some type of case; Apple is banking on us taking care of our new toy device. Finally, nothing is free. Instead of adding a "free" bumper that most people would ignore when they bought a case, Apple saves money on each iPhone made and sells bumpers separately. Why is Apple charging so much for a big rubber band? One reason is that it increases the chance that people will buy a third-party case. I mean, who would spend $29 for a fancy rubber band when you can get a nice case instead? Another reason: Why not make money doing selling iPhone protection? This isn't like the iTunes Store, which was created to drive hardware sales. Accessories are sold to make extra money. If you have an iPhone 4 and are waiting to find the perfect case, be careful with it until you've got some protection for it. 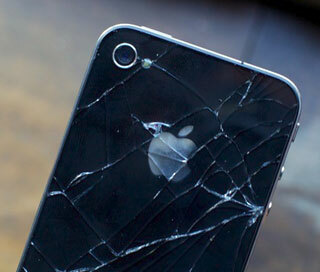 * Editor's note: iFixit speculates that it is made of Corning Gorilla Glass, although Apple makes no such claim. If Apple were using Gorilla Glass, we suspect that they would be open about it, since it's considered a selling point on smartphones that use it.